Oticon Medical is a branch of the company Demant A/S that focuses on providing hearing impaired patients with implantable hearing solutions. Oticon Medical is a branch of the company Demant A/S that focuses on implantable hearing solutions. 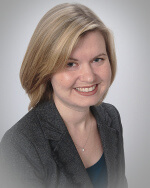 In the U.S., Oticon Medical offers bone-anchored hearing systems. The company also distributes cochlear implants in other parts of the world. The primary devices produced by Oticon Medical for the U.S. market are known as bone-anchored hearing systems (BAHS). These devices are comprised of two parts — a metal implant behind the ear and a sound processor that sits on the surface of the skull. The sound processor portion contains a microphone that picks up sounds in the environment, just like a traditional hearing aid. That’s where the similarity between the two devices ends. While a traditional hearing aid delivers amplified sound into the ear canal that travels through the middle ear and to the inner ear, a BAHS converts the sounds into mechanical energy that vibrates the skull to deliver the sound directly to the inner ear. These devices are often a potential treatment for people who have at least one normally functioning inner ear, such as single-sided deafness (SSD) or conductive hearing loss. Ponto 3 sound processor (external component): The external component houses a microphone to pick up sound from the environment, as well as a sound processor. The sound processor is available in three different power options, in order to accommodate different degrees of hearing loss. Internal component: The implanted component is made of titanium because of its known ability to integrate seamlessly with human bone (called osseointegration). A portion of the implanted titanium component, called the “abutment,” sticks out from the skull to provide a clip for securely attaching the processor after the surgical area has healed. Genie fitting software: The fitting software is used by an audiologist to program the Ponto 3 sound processor according to the wearer’s specific hearing needs. for varying degrees of hearing loss. The sound processor is available for varying degrees of hearing loss, as the Ponto 3, Ponto 3 Power and Ponto 3 SuperPower. The Oticon Medical Streamer wirelessly connects your BAHS with an FM system, loop system or Bluetooth-enabled device. For example, if you use the streamer with your cell phone, it effectively turns your sound processor into a wireless headset, which allows you to better understand conversation via telephone. The Ponto Soft Band can give children and adults the opportunity to experience a bone conduction hearing solution, before committing to a surgical procedure. This is especially helpful for children with hearing loss, who need consistent access to sounds to support learning while waiting for longer-term solutions. 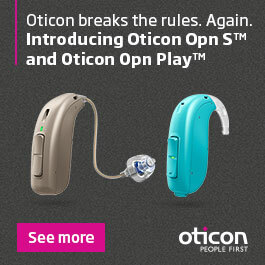 All Ponto 3 devices are built using the same sound processing technology used in Oticon OPN hearing aids. The programming allows users to remain better oriented in their surroundings, separate relevant sounds from noise, focus in noisy environments, and recognize and make sense of incoming sounds. Sound processor upgrades from earlier bone-conduction systems are sometimes possible. 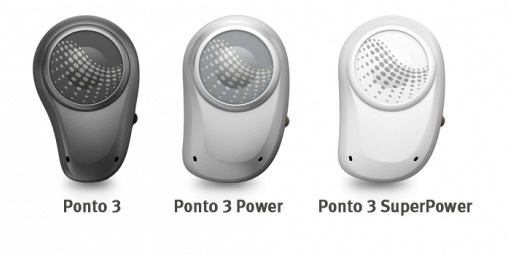 The current Ponto family was preceded by the Ponto Pro and Ponto Plus. Cochlear implant solutions — not available in the U.S.
Oticon Medical also develops and markets cochlear implant solutions for children and adults in other parts of the world. Their current cochlear implant is called the Neuro system. Names of components you may see include Neuro Zti, Neuro One and Neuro 2. Specially trained audiologists and ENT physicians work together to implant, program and help you maintain this type of hearing treatment solution. Contact a clinic affiliated with Oticon Medical to learn more about bone-conducted hearing solutions.